 9.30am pickup in Picton, 10am pickup in Blenheim from your accommodation - please let us know where your accommodation is by emailing us (info@marlboroughtourcompany.co.nz) or calling us: +64 3 577 9997. Exact pick up time will be confirmed with you once booking is made. Begin your wine-fuelled day tour with pick-up from your central Picton or Blenheim hotel, and admire the sloping vineyards and distant mountain peaks as you drive into the heart of the Marlborough wine region, where 75% of New Zealand’s wine is produced. Listen as your guide explains the popularity of its signature Sauvignon Blanc wine, and learn how its unique combination of soil and climate help create its distractive taste. 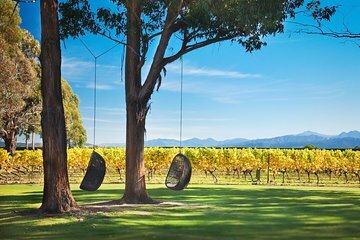 Along the way, stop at several different wineries and cellar doors, where you’ll have chance to stroll around the vineyards, peek inside the wineries, and enjoy wine tasting. After a morning of wine tasting, continue to the magnificent valleys of the Marlborough Sounds, where you’ll have time for lunch (own expense) at a waterfront restaurant. 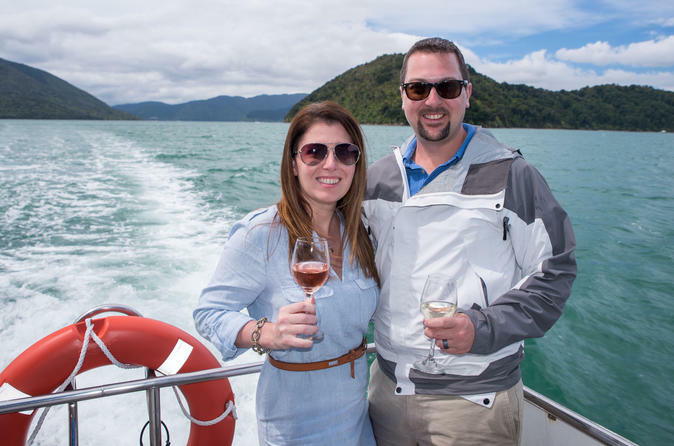 Then, hop aboard for a scenic sightseeing cruise around the Marlborough Sounds, accompanied by a platter of fresh local seafood and a glass of Marlborough Sauvignon Blanc. After soaking up the spectacular scenery, return to shore, where your driver will be waiting to take your back to your hotel. Nice mix of wine tasting and a harbor cruise. We ended up being the only two on the wine tasting portion of the tour, so Graham let us chose were to go for our tastings he gave us recommendations, of course. After our morning tastings, we had lunch in Havelock at the Captain's Daughter, which was very good. The cruise was a relaxing end to the day. The mussels were tasty, and there were plenty of them. There was also additional wine/beverages available for purchase on board the boat for reasonable prices. Good 2 wineries and boat cruise around the sounds with mussels was good. Would have loved to go to a 3rd winery. This was a wonderful tour. After I was picked up in Picton by Matt right on time, we picked up others on the tour at various places along the way, giving me the chance to see a lot of the local countryside. We then visited to two Marlborough wineries - the larger Marlborough icon Cloudy Bay and the smaller, family-run Wairau River Winery. We were given a good range of quality wines to taste at each. Throughout the winery leg of the tour Matt provided excellent commentary on the region and its wines. We then drove to the Slip Inn in Havelock for lunch before boarding the boat for a tour of that part of Marlborough Sounds. Matt then skippered the boat and provided informative commentary about the spectacular scenery we passed and the local mussel farming industry, while Lexie kept the freshly cooked greenshell mussells and local wine including some we had tasted earlier coming until we had eaten our fill. I booked this tour for my wife's birthday. Graham picked us up in a Mercedes van at our hotel in Picton he's a retired gentleman who does this on a part-time basis. We only had one other couple on the tour. I know this area is known for Sauvignon Blanc, but we prefer Chardonnay and let Graham know. He took us to two wineries the first was Cloudy Bay which is owned by the holding company which owns Louis Vuitton. It was a beautiful setting and the woman that conducted the tasting was delightful. The grounds were very green and peaceful. The second winery was Wairau River Winery, which was smaller and family owned. The lady doing the tasting was also very nice and offered more tastings that I'm sure she was supposed to. We then drove to Slip Inn for lunch outside on the water-excellent. We boarded the boat for a tour of the sound with a group of others. The captain was a nice young man and the views were beautiful. Graham cooked the mussels and everyone gathered around with wine and ate them. The captain's commentary was very interesting about growing the mussels. I'm not a big fan of them, but it was a very fun day. Graham was an excellent and friendly guide and told us a lot of interesting things on the tour. Highly recommend!